Does the man feel performance anxiety while planning the baby? Some couples think that IVF is just all they want to get resolved with the issue of their infertility, but it is not. Although IVF is a universal remedy for infertile couples but there are numerous factors attached with it that adds favourable outcome from IVF treatment. We all know that a happy family or complete family is said when there is mother, father and their child/children supposed to be present and it is better to take support by fertility treatments if you are not able to conceive due to your fertility issue. If you have been trying to get pregnant for more than 1 year, stop waiting and settle on fertility treatment. Since you all know that IVF is one of the best fertility medications, that cures your all fertility related issue but one thing you need to know about this medication, i.e. Not every method comes with a guarantee package and IVF itself relies on some major factors to attain success. You need to know those factors that influence the success rate of IVF. If these factors are not fulfilled during the medication, then unfortunately result will be unfavourable and thus IVF fails. So, all i want is to make those infertile couples (who are planning for their IVF) aware about some factors that Why IVF Fails. If the given factors are executed successfully then undoubtedly the couple’s IVF will worthwhile. This is one of the major points if you had your IVF failed. Egg always plays significant role in achieving positive out-turn in IVF treatment. Female’s eggs not only in IVF treatment but also in several ART techniques have a major impact on getting success in IVF. Healthy eggs are best available in women near the age of 35 comparing with those women who have turned around 40 of her age. I have been gone through several cases, where women, who are younger enough, still produce low or poor quality of the eggs. This also leads to unsuccessful IVF. Generally women who have crossed her age of 35, lay unhealthy quality of eggs- for this case, we use egg donor to accomplish the rest of IVF procedure. Sperm carries out complex role in the step of IVF fertilization. Fertilization in IVF medication means- penetration of the sperm with the egg of the female. If fusion does not take place, fertilization won’t. So for fertilization, healthy sperm is always required. Sperms must be active, motile and sufficient in quantity in order to bring off fertilization process. If the sperm is non-motile or lack in number of count, then IVF fails. As mentioned in the first point, I said that Age of the female if below 35, produces healthy and in good shape. Female’s age is the crucial factor that makes the head way of IVF success. As the age of the woman increases, a chance of IVF decreases. It is because, female’s body respond to the IVF medication according to her fitness and health, and if she has crossed her suitable age, then it might happen her IVF may fail. Usually, a female releases a single egg in each month from her ovary. During IVF cycle, we give fertility medication and drugs to increase the number of counts of eggs; here if the female has low number of eggs or elevated FSH level, her body might not respond appropriately to these medication. Therefore, it is mandatory that female health, age fitness must be suitable for IVF medication and all the steps. This is crucial point to get positive outcome by IVF treatment –successful embryo implantation. Embryo must be placed in the exact and correct location by the fertility experts. Embryo implantation failure could happen of two reasons- first is due to the issue with the embryos or issue with the female’s uterus. It happens at some cases that embryo lives till day 5 after the embryo implantation, this may happen because of poor quality of the embryo, week embryo that does not grow beyond a certain stage. One of the best ways to improve the chance of IVF success is to opt for PGS testing, this allow the fertility experts to look and detect if any genetic or chromosomal abnormalities is present in embryo or not. Hence to bring to fruition of IVF success is all you have to keep above factors in mind. Age, Quality of the eggs, sperm motility, female’s uterus condition- these are all the important factors that influences the success rate of IVF treatment. So, before planning for IVF medication, you need to fulfill these requirements first. 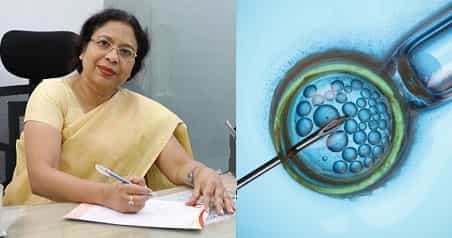 I have handled several cases, where the couple though having IVF cycle failed, insist on using their own eggs or sperms instead of using donor eggs or sperms, if you are thinking this then it is somehow waste of your money and time. Think wisely before going for any of the decision, it is best to take suggestion from your fertility expert.